Excerpt from U.S. Coast Guard “Proceedings of the Marine Safety & Security Council” magazine. By CAPT Denise L. Matthews, former commanding officer, U.S. Coast Guard Marine Safety Unit Paducah; LTC Steven J. Roemhildt, Nashville District engineer, U.S. Army Corps of Engineers; and LCDR Thomas J. Kaminski, former supervisor, U.S. Coast Guard Marine Safety Detachment Nashville. On August 3, 2006, a tank barge carrying 20,000 barrels of mixed xylene was damaged while locking upbound through Wilson Lock and Dam (L/D) in Florence, Ala. The towing vessel M/V Potomac was pushing the jumbo barge (297 feet by 54 feet), HTCO-3016, at the time of the incident. 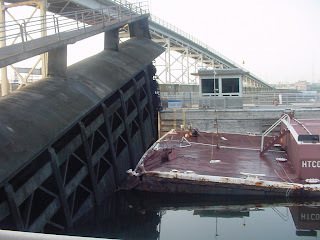 As the lock chamber filled, the barge came into contact with the upper lock gate, dislocating it from its track. As this upper gate fell back into place, the barge became wedged beneath it, as seen in the picture. For more than four months, local, state, and federal agencies worked closely to safely remove the damaged tank barge and repair and reinstall the damaged lock gate. They also had to manage constantly changing vessel queues to minimize economic impact to the marine transportation system, its suppliers, and customers. economic impact due to lock delays. By late afternoon on August 3, a unified command was established that included senior representatives from Coast Guard Marine Safety Unit Paducah, TVA, the U.S. Army Corps of Engineers (USACE is the operator of the lock and dam), the Florence Fire Department, and Maryland Marine Inc. (owner of barge HTCO-3016). The initial objectives of the unified command were protecting the community, responders, and maritime industry; safely securing and removing HTCO-3016 from under the lock gate; and beginning operation of the Wilson auxiliary lock to keep barges moving through the area. USACE also began construction of a temporary dam and a support structure for the damaged lock gate. Since the dislocated and damaged lock gate was sitting atop—and therefore supported by—the damaged barge, the plan was to pump out water to lower the barge, thereby transferring the lock gate’s weight to the newly constructed support. On August 5, the U.S. Army Corps of Engineers completed the removal of HTCO-3016. On the morning of August 6, USACE reopened the auxiliary lock to commercial vessel traffic, which had grown to seven towing vessels and 90 barges awaiting lockage. By the afternoon of August 9, the vessel queue had increased to 15 towing vessels and 139 barges loaded with a variety of cargoes. The significant decrease in Wilson L/D’s ability to lock commercial vessel traffic resulted in significant economic impact to the towboat industry and the Tennessee River marine transportation system—approximately $29 million. Additional costs were prevented due to outstanding stakeholder cooperation. On August 8, the MSD Nashville supervisor attended a U.S. Army Corps of Engineers briefing where USACE expressed its understanding and concern for the economic impact this incident would have on the river industry. In general, USACE used “first-in, first-out” prioritization to lock barges but also requested representatives to serve on an industry-led queue management board to help make decisions on priority lockage requests. Priority lockage decisions were made based on type/amount of cargo and impact on industry. On August 17, USACE removed the damaged lock gate, and on August 18 commenced use of the temporary caisson configured for main gate lockage. USACE then began weekly teleconferences to communicate lock repair, vessel queue status, and caisson-use schedules to the Coast Guard, TVA, and industry stakeholders. This process continued until the damaged main chamber lock gate was repaired and reinstalled. Wilson L/D resumed normal operations on December 5. Subscribe online at http://www.uscg.mil/proceedings/subscribe.asp. Online survey available at: http://www.uscg.mil/proceedings/survey.asp.